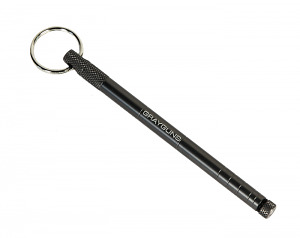 A compact aluminum firearms range tool with a key chain ring for easy portability. The has 8-32 threads for use with common cleaning brushes and jags. the magnetic tip can be used for retrieving parts. The length is 5 inches and can be used to remove barrel obstructions 9mm and larger, as well as an engraved scale for measuring groups.